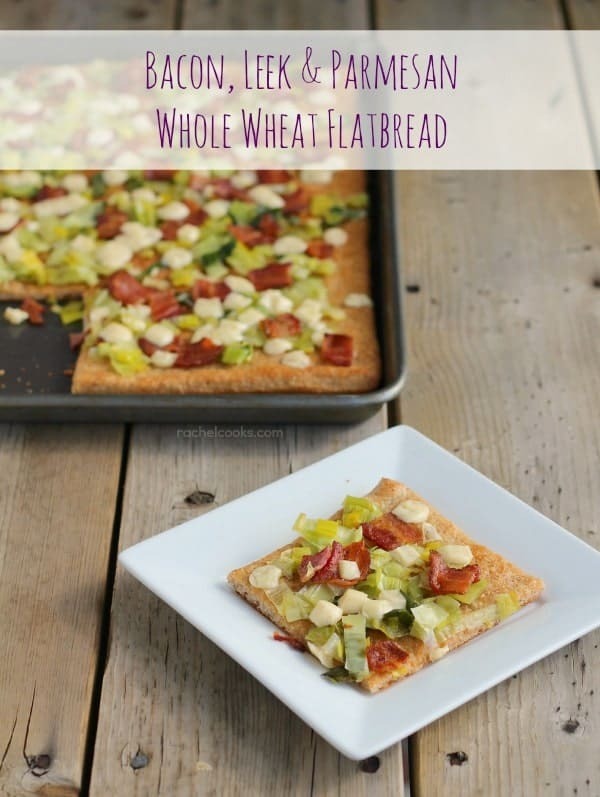 This easy and fun whole wheat flatbread would make a great dinner, appetizer or even breakfast or brunch! Do you have certain things that you buy every time you go to the grocery store? 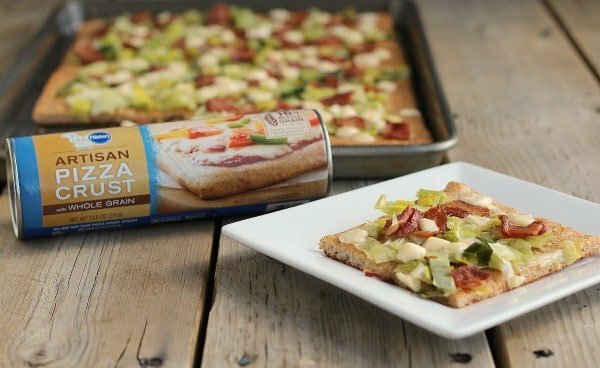 This is completely NOT sponsored — but I’ve been buying Pillsbury’s Artisan Pizza Crust nearly every time I go to the store. The best part about them is that they’re a refrigerated dough that you just need to roll out and place on a pan and bake. It fits my 12×17 pans perfectly and bakes up so nicely. Don’t get me wrong, I love a homemade pizza crust but let’s be real. This lady has a 3-year-old and a 1-year-old. Kneading and two rise times don’t jive well with my schedule. This roll of pizza dough is in the fridge standing by for that night when I don’t feel like cooking. 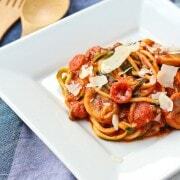 It’s easy, tasty and everyone loves it. Mine usually finds itself topped with pizza sauce, mozzarella and pepperoni but this time I did something different. I actually made this for dinner one night that we were doing breakfast for dinner. I paired this bacon, leek and Parmesan whole wheat flatbread with mini frittatas and some fruit. 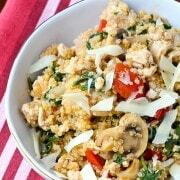 Easy, healthy, and most importantly? Delicious. And there’s bacon so that’s automatically a win. I liked the taste of the little bits of Parmesan but if you can’t get over the look of them (is it just me or do they look like marshmallows? 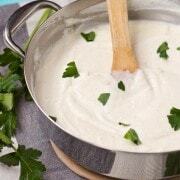 ), you could also grate the cheese over the top of everything for a more uniform blanket of cheese. Enjoy! Preheat oven to 400 degrees Fahrenheit. Spray a 12×17 rimmed baking sheet with olive oil spray. Spread whole wheat pizza dough so that it covers the entire baking sheet. Brush with olive oil. Bake for 12 minutes. Meanwhile, In a medium frying pan over medium heat, saute the leek in butter (sprinkle with pepper) until softened and translucent, about 10 minutes. 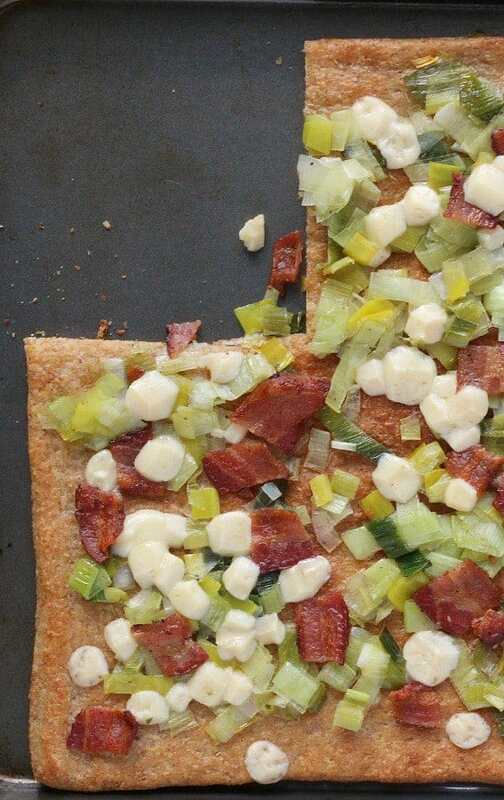 After the crust has pre-baked, remove it from the oven and cover it with the sauteed leeks, bacon, and parmesan cheese. Bake for 6 more minutes, remove from oven and let rest for 2 minutes. Cut and serve. Husband’s take: I was worried that this might be too “weird” for him but he really liked it! Can’t go wrong with bacon. E loved it too. 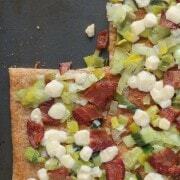 love flat breads..i hardly use anything from the refrigerator section, will definitely be checking this out. I love leek and parm together. These toppings are hitting me right in my happy place! I’ll take it for breakfast, lunch, and dinner. Please and thank you. We buy that pizza crust all the time, too! I love it so. And I can’t even imagine the magic it must create when bacon and Parmesan cheese are involved. I don’t even need two little kids to find a reason to use Pillsbury doughs; their flatbread and crescent rolls are a staple for me. Sure a homemade crust is great but too often not in the cards and I simply love combinations like this that can be made quickly for dinner or if friends drop by. I haven’t had a red sauce, pepperoni type pizza thing in YEARS! Oh man this flatbread looks so incredible!!! Yummy!